Analysis of agriculture in countries’ climate change mitigation and adaptation strategies finds: Most Parties to the UNFCCC include agriculture in their mitigation targets (80%) and adaptation strategies (64%); Non-annex 1 Parties note the need for international financial support to implement their INDCs and raise the ambition of their contributions; For countries to meet their targets, climate finance will need to address agriculture. Richards M, Gregersen L, Kuntze V, Madsen S, Oldvig M, Campbell B, Vasileiou I. 2015. 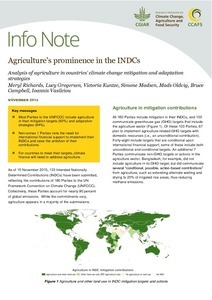 Agriculture's prominence in the INDCs. CCAFS Info Note. Copenhagen, Denmark: CGIAR Research Program on Climate Change, Agriculture and Food Security (CCAFS).